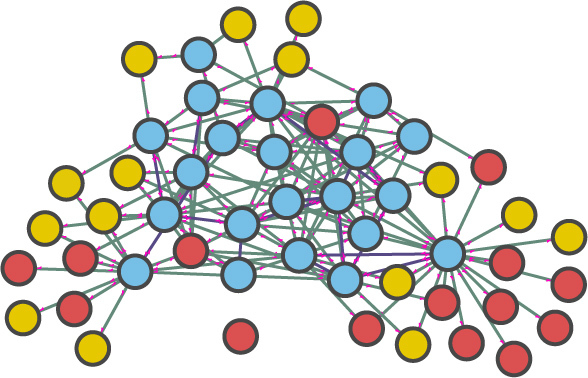 The image to the left is a network graph showing all of the synaptic connections in the pharynx of the nematode Prisitonchus pacificus. The pharyngeal nervous system in nematodes is almost entirely independent from the rest of the body, so this is essentially a map of the pharynx “brain”. The data are still unpublished, so I can’t put in the cell names yet. Still, it is a thing of beauty that I wanted to share! There are only 20 neurons in the pharynx, so it is a relatively small neural system. There are some very interesting differences in pharynx behavior between different nematode species, and eventually we would like to use such diagrams to help understand the neural basis for evolutionary changes in behavior. From this network we are already learning some very interesting and unexpected things. I’ll be presenting these data for the first time at a meeting on C. elegans neuroscience at the end of this month in Madison, Wisconsin. I am really very excited to be sharing this, and can’t wait until it moves into publication! I used the open source software Gephi (www.gephi.org) to make the graph. It is a pretty awesome package that is under active development that allows me to make some pretty nice looking representations of the data as well as do some basic analysis.